A medallion is a decorative cover that extends many inches farther out from the ceiling box to cover up any holes in the ceiling around the ceiling box. 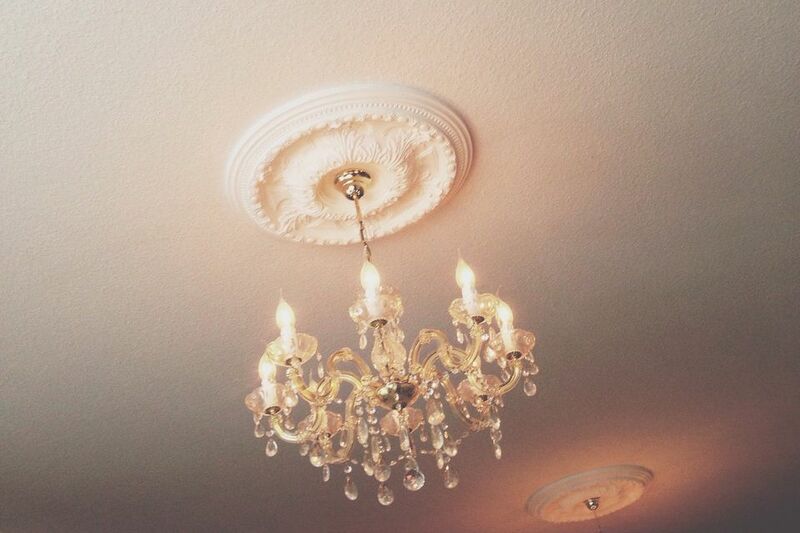 Medallions are a great way to cover an over-sized hole around a ceiling box. Without it, the cover-plate on your ceiling fan or light fixture wouldn't cover the hole in the ceiling. Depending on the type you get, some can be painted to match the existing ceiling color. Others come in brass, antique brass, and other colors that are made to match the ceiling fan or light fixture. In older homes where you don't want to do major work like painting everything, just updating things like lighting, and so on, a medallion is a great choice. Sometimes when you take down an old light fixture, there is a large cover on the light or the light itself is very wide. When you remove it, sometimes you find out that someone else painted around the light cover plate, instead of taking the light down to paint the entire area. This is quite troubling when the new light fixture fails to cover to the same point, leaving a mismatch of colors by the light. You could paint the ceiling, but that takes time and money, not to mention taping and covering the area. You could try painting just the area that doesn't match in color, but old paint colors can be very difficult to match. For that reason alone, it can be easiest to choose a medallion to cover the original area the old light covered. Choose the medallion color carefully, and try to select a style that resembles the light fixture style that you are installing. If needed, caulk the inner edge of the medallion to stop any air from the attic. be sure that the medallion sits flush and secure to the ceiling and that it indeed covers the area of unlike paint colors. By taking these steps, you'll have a nice looking product when finished! In order to install a medallion, first, you must turn off the power to the lighting circuit. Turn off the circuit breaker or fuse and check the circuit with a tester. you can also turn on the light switch and leave it on while shutting off the breaker. When the light goes out, you've found the circuit. As we always will tell you, double-check the circuit with a tester. Safety first! Next, lower the ceiling fan canopy and disconnect the wiring from the electrical ceiling box. Take the fan down and install the medallion over the opening and center it. Reinstall the ceiling fan and wire it back up. Attach the canopy and tighten the mounting screws. You've now installed the medallion and made the ugly hole in the ceiling disappear.